Research shows consumers increasingly seek out enriching, local experiences when they travel. Now, with summer vacation right around the corner, Marriott is rolling out local-area expert recommendations, bespoke categories, and hand-curated lists of things to do on the substantially expanded Marriott Moments to help all travelers and locals discover experiences that speak to their passions and inspire personal fulfillment. This summer, Marriott has tapped into the company’s global network of thousands of local-area experts including its hotel associates, as well as global partners and celebrities to recommend their favorite sites to see and must-do activities. Throughout Marriott Moments, expert recommendations from hotel general managers, chefs and mixologists, luminary partners Chefs Daniel Boulud, Eric Ripert and Stephanie Izard, as well as actress and singer Lea Michele, world champion freestyle skier Gus Kenworthy and sports broadcaster Michele Tafoya will be featured, with more local area expertise from Marriott hotel associates to be added regularly. As a complement to the recommendations, Marriott Moments will offer bespoke categories based on passion points, types of travel companions, and personality traits including “Pop-Culture Vulture,” “Exhaust Your Kids and Be the Family Hero,” and “Young, Broke & Fabulous.” All recommendations and categories will feature hand-curated lists of the best things to do from around the world, available for purchase with any major credit card. Additionally, as an answer to the age-old question “what should we do now,” Marriott has brought the ability to find and book experiences to Facebook Messenger. Now, in addition to visiting the website directly, anyone can chat with Marriott Rewards or SPG on Facebook Messenger to get location based recommendations of close-by Marriott Moments they can purchase on their phone. Actress and Singer Lea Michele recommends her favorite museums, shopping areas, hikes and concert venues in LA and NYC. World Champion Freestyle Skier Gus Kenworthy recommends his favorite off-the-beaten-path museums in Paris, Boston and London, as well as his favorite ways to explore the Matterhorn in Switzerland, Lynn Canyon in Vancouver, British Columbia, San Francisco and beyond. Sportscaster Michele Tafoya recommends active experiences including picturesque bike rides along Manhattan Beach, Sydney Harbor or the Loire Valley countryside in France; and thrills like a helicopter ride to a glacier and dog-sledding in Juneau, Alaska. Chef Eric Ripert recommends his favorite food markets, restaurants, jazz clubs, spas and hikes around the world from Puerto Rico and Chicago, to Bhutan and Marrakech. Chef Daniel Boulud recommends his favorite food markets and restaurants in NYC, San Sebastian, Lyon, Singapore and more. Chef Stephanie Izard recommends her sure-fire ways of getting to know the culture and history of cities on three continents. Further personalizing travel experiences, Marriott Moments has added several new partnerships, including a partnership with Eatwith, an online community to find and book culinary experiences with locals in 130+ countries. From an elegant dinner party in a New York loft, to an authentic feast with a Roman family, to a gourmet pastry class in Paris, Eatwith’s experiences with hand-selected hosts are bringing people together through food and enabling travelers to immerse themselves in local cultures. Additionally, Moments now offers newly developed on-property activities for guests looking to take part in unique experiences from the comfort of their hotel, starting with experiences in Miami like the private Champagne Sabering or Mediterranean Cooking Class at The St. Regis Bal Harbour, with plans to grow these unique hotel experiences globally in the future. Last month, Marriott announced the expansion of Marriott’s Moments eco-system which now includes over 110,000 new must-see attraction and top-rated activities open to anyone, and 8,000 exclusive Moments for members of Marriott Rewards and Starwood Preferred Guest (SPG) that can only be redeemed with points. Members who purchase a Moment using a credit card will earn points. 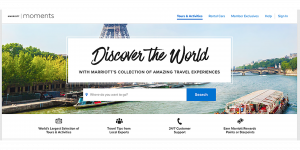 Marriott Moments was created in partnership with PlacePass, a pioneering provider of travel technology solutions offering travelers a leading online meta-search platform for in-destination experiences. The company’s investment in PlacePass is just one example of how Marriott is innovating by working with startups to bring great new solutions to our guests. Marriott Rewards, which includes The Ritz-Carlton Rewards, and SPG are all free to join by visiting members.marriott.com.